Blurring the lines between spectator and spectacle. We make the technology that powers the world's best ideas. Innovation never stands still. This is Lenovo. We’ve teamed up with Lenovo Yoga Series to profile young Australian disruptors who are changing the game in their chosen field. Check out the full list here. From partying with the dinosaurs at Sydney’s Australian Museum to role playing on the tarmac of a Melbourne airport, The Festivalists are bringing culture to the masses in wonderful ways. Already ten years young, the non-profit events company has earned a rep for roping in a wide bunch of audiences and showcasing the best artists and films you’ve never heard of. They’ve succeeded not only in transforming the Australian Museum from field trip to fabulous on steamy Jurassic Lounge nights, but in taking over historical sites like Elizabeth Bay House and the Justice & Police Museum to recreate infamous parties from Sydney’s bawdy history. Their film festivals create both immersive experiences – like the secret locations and choose-your-own-adventure vibes of Secret Cinema – and accessible ones, like senior film festival Young At Heart. At the wheel of the party bus is French-born director Mathieu Ravier, whose nomadic lifestyle has given the company a thirst for the fresh. Having lived and worked everywhere from San Francisco to Manchester – with Tokyo, Toronto and Hong Kong tossed in there somewhere – Ravier eventually settled in Sydney and promptly began putting on events. In response to the closing of independent and repertory cinemas everywhere, Ravier and co-founder Marianna Alla dreamed up The Festivalists in 2005 with the aim to run film festivals. Some of the organisation’s longest-running film festival ideas include monthly shorts night Kino Sydney, which is about to celebrate its 100th event, and US and Canadian film festival Possible Worlds, now up to its 10th instalment (and counting). Five years later, The Festivalists began taking over cultural institutions and slightly odd spaces to flavour them with what Ravier describes as “our own special sauce of interactive entertainment, food and drink, talks and live performances”. Just last month, Festivalists manager Karina Libbey programmed the Justice & Police Museum into legendary Sydney cabaret nightclub Chequers on the night of its most outrageous party in 1969, as part of The Festivalists’ Mayhem series of events. “I love parties that you leave smarter than you entered, that invite you to look at your surroundings differently, and where the line between visitors and performers blurs,” says Ravier. Ravier is particularly interested by international trends in film festivals, especially when it comes to programming and audience development. He points to Rotterdam’s redefining of ‘arthouse’ cinema in the 1990s and Austin’s South by Southwest series of festivals and conferences that bring together scientists, coders, filmmakers and musicians. India’s International Film Festival of Kerala, he says, confirmed his suspicion that “a film festival without a conversation around film is only half a festival”. Constantly exploring new trends and immersive blasts for keen audiences, Ravier is bursting with enthusiasm – which is pretty impressive for someone who attends every party the organisation puts on as well as two ‘research events’ per week. He points to “immersive hybrid experiences” like British theatre company Punchdrunk’s New York-based production Sleep No More, and Door Into The Dark from Bristol-based creative digital company Anagram. 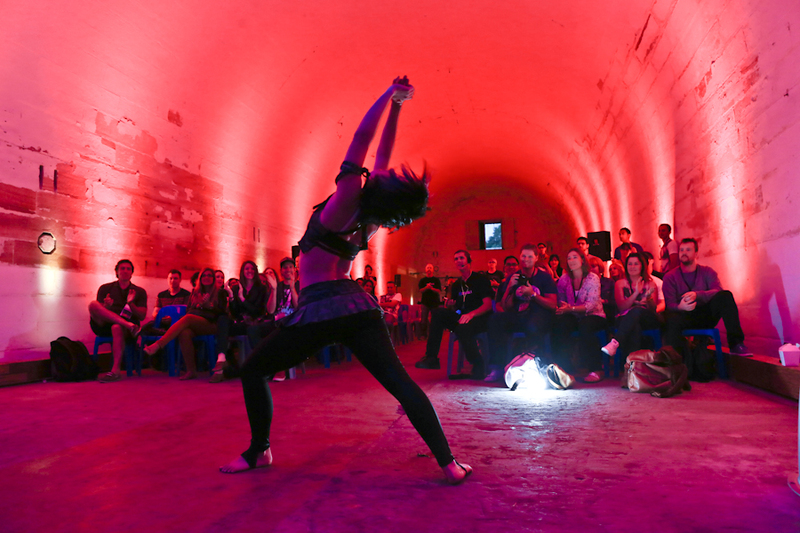 MONA events like Mofo and Dark Mofo are also favourites, as is the accessibility and playfulness of the Underbelly arts festival in Sydney. Rather than profit from their events, The Festivalists aim to create interactive cultural experiences that support both artist and audience in a kind of super-fun symbiotic relationship. “We only take on jobs that we feel passionate about, that push us to innovate and allow us to program under-represented or deserving artists,” says Ravier. But after a decade of magnificent events, he is hoping The Festivalists will find opportunities to pass on a little bit of that magic.